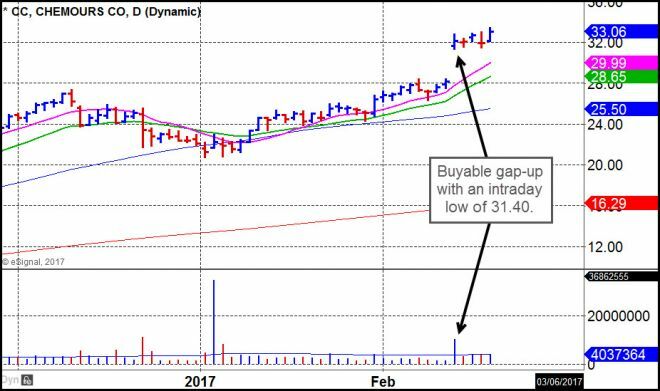 GM - NTES posted a big-volume buyable gap-up on Thursday after beating on earnings after the close on Wednesday. We put the report out early while the stock was within buying range of the intraday low at 278.80. I would look at any pullback closer to Friday's intraday low at 289.83 as a possible lower-risk entry. Another thing to be aware of here is that NTES is sitting just below the $300 Century Mark, and a move up through 300 could trigger the Jesse Livermore Century Mark Rule on the long side. Dr. K - Leading Chinese stocks have been in uptrends, overall. NTES is leader as it sports top-line fundamentals and technicals. When buying a stock, always know your exit point. It closed about 6.5% above the low of its gap up day. One might look to buy it at a lower price to reduce their level of risk, assuming one uses an undercut of the low of the gap up day as their stop. 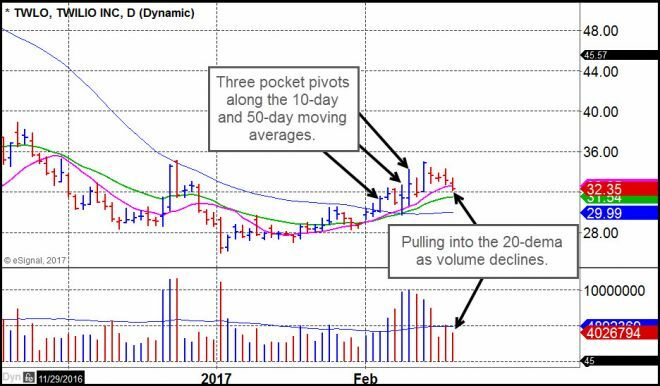 GM - NTNX posted a nice strong-volume pocket pivot on Wednesday. It has since pulled into its 20-dema on volume that was -38% below average, low enough to qualify for what we refer to as "voodoo" volume levels. This puts the stock in a lower-risk buy position following the pocket pivot, and is consistent with our preferred methods of buying constructive weakness following a show of strength. Dr. K - The pullback to its 20-day line is not surprising after its reversal on Thursday on above average volume. It closed midbar on low volume which is constructive and is thus in buying range using the 20-day as a selling guide. 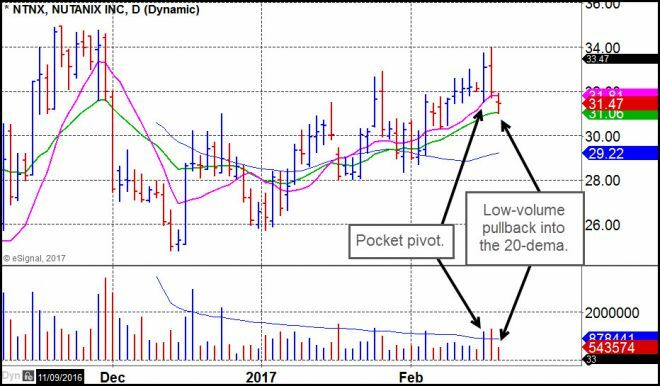 GM - TWLO has posted several bottom-fishing pocket pivots as it regains its 50-day moving average for the first time since topping in October 2016. The stock recently came off of an IPO lock-up and now all shares of the company are eligible for sale by insiders who so desire. The lock-up expired two Fridays ago following the three pocket pivots, and the stock is pulling back slightly as it absorbs some selling pressure. It is moving down closer to the 20-dema, where a lower-risk entry point may be found IF volume continues to dry up constructively. Dr. K - Stocks with huge price momentum such as TWLO often rapidly rise due to their perceived potential. TWLO looks as if it is attempting to form the right hand side of its base. It could thus move higher in stops and starts as it makes its way through overhead resistance. 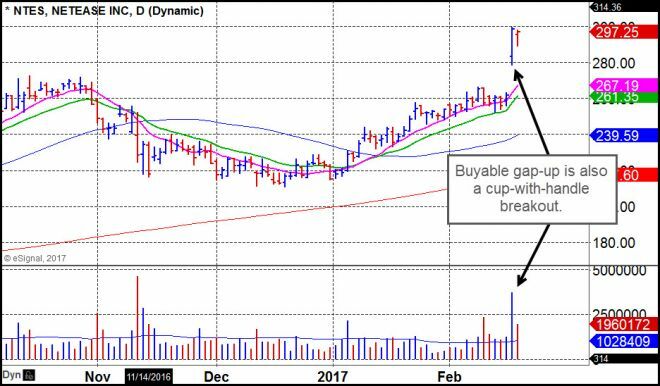 One should be quick to take profits since this stock can gain several percent in a day such as on Feb 9 and 13. GM - THO broke out on a buyable gap-up the week before last, and has edged a litle higher since then. It is now holding tight and just above the 10-day moving average as volume dried up to -41% below average. 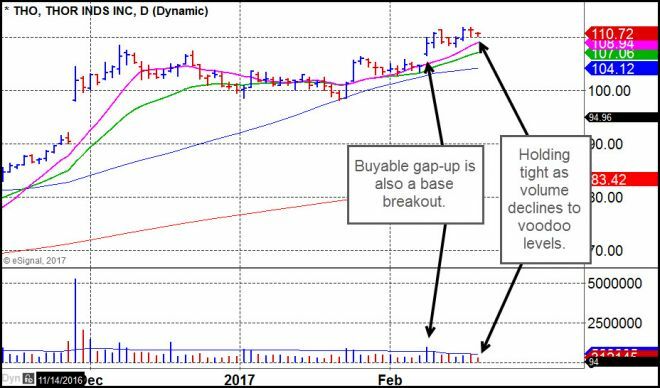 This puts the stock in a lower-risk entry position, although it is still within buying range of the BGU base breakout. Any pullback to the 10-day line, about 2% lower, would offer a very optimal entry should that occur. Dr. K - THO has had a number of gaps higher over the past year, and has gapped higher on each of its last five earnings reports, a highly constructive sign. The price momentum in this stock remains strong at the current time. GM - Steel names have been on the comeback trail, and we have favored U.S. Steel (X) as the primary leader in the group. 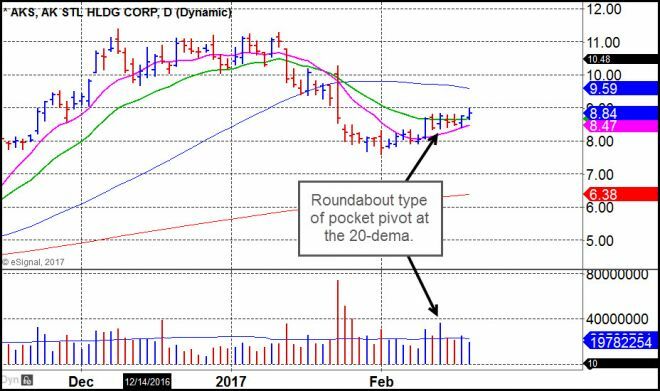 AKS is attempting to round out the lows of a possible new cup-type base by posting a roundabout pocket pivot on Monday at the 20-dema. The stock remains within buying range of this pocket pivot. Dr. K - Industry group rank for steels is 5. AKS could catch up with X as their charts heavily correlate. Another steel stock, STLD, also correlates but is less volatile. GM - CC posted a nice buyable gap-up on Monday of this past week with an intraday low of 31.40. Any small pullback from Friday's close at 31.06 would present a lower-risk entry opportunity. Dr. K - CC has been a price leader. Buying at Friday's closing price is 5% away from the low of the gap up day. Given our suggested undercut allowance of 1-3%, one may wish to buy at a lower price to reduce this level of risk.